Two-Nuts Chocolate Confections Luscious home-made candies and chocolates available in the Harrisburg, Camp Hill, Hershey, Carlisle, PA area, Two-Nuts Confections has a new menu of candies this season… Chocolate Peanut Butter SmoothiesChocolate Peanut Butter Smoothies – so smooth with a blend of three chocolates and creamy peanut butter… yum! Chocolate Coconut Haystacks, with mounds of moist coconut in rich chocolate. Chocolate Raspberry Truffie is a dark chocolate lover’s dream with its truffle-like center dipped in rich dark chocolate. Chocolate Raspberry TruffieOur made to order candies include Chocolate Espresso Martini Clusters, Caramel Crunch Clusters, Chocolate Pecan Turtles, Dark Chocolate Raspberry Bark, Chocolate Almond and Chocolate Pecan Toffee, and many more. Velvety-rich and smooth, we offer distinct chocolate gifts for all occasions. 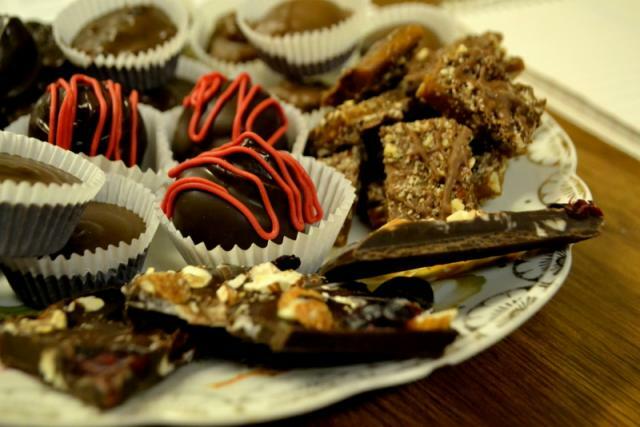 Two-Nuts sells our delectable chocolate, nut and fruit candies in the Harrisburg, Camp Hill, Hershey, Mechanicsburg and Carlisle areas, and also offers shipping. "Click To Candy Shop" on the left menu to view and purchase.